Bacteria are microscopic organisms that comprise the domain Eubacteria. A domain is the highest grouping of organisms, superseding the level of kingdom in the classical Linnaean system of biological classification. There are three domains, two of which, Eubacteria and Archaea, are composed entirely of prokaryotic organisms; the third domain, Eucarya, encompasses all other ( eukaryotic ) life forms, including the single-cell and multicellular protists, as well as animals, green plants, and fungi. Unlike eukaryotic cells, prokaryotic cells lack nuclei and other organelles , and tend to be less complex. 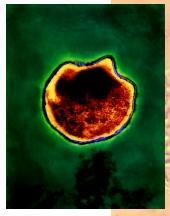 The spherical-shaped Chlamydia pneumonia bacteria. Reproduction in bacteria involves duplicating the genetic material and dividing the cell into two daughter cells, a process known as binary fission. Under very favorable conditions, certain bacterial cells can divide as often as once every twenty minutes. Some bacteria, such as Clostridium and Bacillus species, possess the ability to form a resting state, or "spore," when unfavorable conditions are encountered. These spores are very resistant to heat, drying, radiation, and toxic chemicals. Bacterial spores have reportedly been reawakened from a 250-million-year-old salt crystal that existed before the time of the dinosaurs. Sterilization techniques used in medicine must overcome these resistant properties. It is not known whether the ancestor of bacteria originated on Earth or elsewhere. Some scientists believe that a life form existed extraterrestrially in the Martian meteorite ALH84001. Whether primitive life originated on Earth or elsewhere, current consensus is that bacteria were present on Earth 3.8 billion years ago. 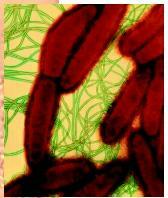 Colored transmission electron micrograph of the rod-shaped E.coli bacteria, showing its long flagellae. Bacteria show an incredible range of metabolic diversity. Some bacteria can get their energy from light (these are referred to as phototrophic organisms), organic compounds (organotrophic), or inorganic compounds such as hydrogen (H 2 ), sulfur compounds (H 2 S), inorganic nitrogen compounds or ferrous iron compounds (chemolithotrophic). Some bacteria can make all of their organic compounds by fixing carbon (autotrophic), while others need to break down organic compounds to provide a carbon source (heterotrophic). Many bacteria are capable of fixing atmospheric nitrogen as a nitrogen source, in addition to organic and inorganic sources of nitrogen. Because of this metabolic diversity, bacteria play an important role in biogeochemical cycles such as the carbon, nitrogen, and phosphorous cycles. While most bacteria are free living at some point of their life cycles, many bacteria are capable of living in close associations with other organisms, including eukaryotes. Some of these so-called symbiotic associations are so highly evolved as to be obligate, while other associations are facultative, meaning the symbiotic partners can live apart from each other. In some symbioses, the eukaryotic host provides a highly specialized structure within which the bacteria reside, such as the nitrogen-fixing root nodules found on leguminous plants, such as clover, or the rumen possessed by some herbivorous mammals. Looser symbiotic associations exist where the host provides no specialized structure for the symbiotic bacteria. Organisms that populate the root zone of plants can provide growth benefits; these bacteria are in turn making use of plant products exuded though the roots. There are also bacteria that are very harmful or even fatal to eukaryotic hosts. An example of this is Yersinia pestis, causative agent of the bubonic plague. Not all associations between bacteria and their eukaryotic hosts have such a drastic result. Many bacteria exist in relatively benign associations with their hosts, such as the Escherichia coli bacteria in the human large intestine. Some resident bacteria can become pathogenic under certain circumstances. These opportunistic pathogens can cause serious infection in hosts whose defenses are compromised by age or previous illness. Friedmann, E. I., J. Wierzchos, C. Ascaso, and Michael Winklhofer. "Chains of Magnetite Crystals in the Meteorite ALH84001: Evidence Of Biological Origin." Proc. Natl. Acad. Sci. USA 98, no. 5 (2001): 2176–2181. Vreeland, R. H., W. D. Rosenzweig, and D. W. Powers. "Isolation of a 250-Million-Year-Old Halotolerant Bacterium from a Primary Salt Crystal." Nature 407 (2000): 897–900. the information on this site is wonderful. i will forever use this site into learn more and more about microbes. keep up the great work. Super dope site, totally gonna push off my bio project tho.